AUGUSTA -- Gov. Paul LePage exercised his own editorial judgement when he described the IRS as the "new Gestapo" during his recent radio address. However, the governor acknowledged Monday that his reference to the Nazi secret police force "clouded" his message about the federal health care law. 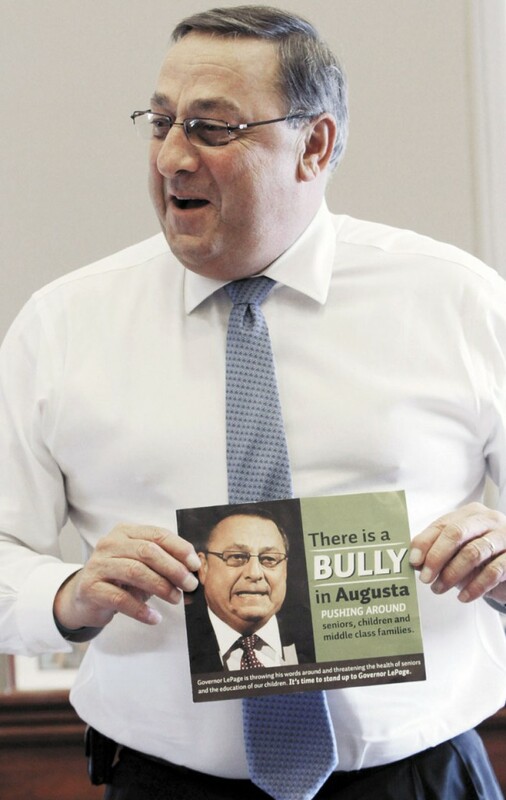 AUGUSTA — Gov. Paul LePage exercised his own editorial judgement when he described the IRS as the “new Gestapo” during his recent radio address. However, the governor acknowledged Monday that his reference to the Nazi secret police force “clouded” his message about the federal health care law. The governor’s written statement on Monday stopped short of a public apology, which had been demanded by national and local Jewish groups. However, Emily Chaleff, director of the Jewish Community Alliance of Southern Maine, said LePage called her to apologize personally for his remarks. Monday’s events marked the third day of a controversy that garnered national media attention about a comment that LePage personally added to his weekly radio address. Adrienne Bennett, LePage’s communications director, often writes the governor’s radio message. That was the case last week; however, Bennett said the governor inserted the Gestapo reference after she and staff members finished editing it. Bennett said the comment initiated a “healthy dialogue” among staff members, but it remained in his prepared remarks when LePage recorded the address on Friday. It was not ad-libbed during recording. The detail adds context to the governor’s remark. Some of LePage’s opponents originally believed that the administration cleared the comment to spur opposition to a health care law that divides the American public. The “Gestapo” comment was a reference to a provision in the Affordable Care Act that requires Americans not insured by their employers or Medicaid to buy health insurance or pay an annual penalty when filing their tax returns. The provision, known more broadly as the individual mandate, was the subject of a multi-state lawsuit. Maine was a plaintiff in the lawsuit. The mandate was upheld recently by the U.S. Supreme Court. The Gestapo was Nazi Germany’s official secret police under Adolf Hitler, who imprisoned and murdered millions of people during World War II. Response to the governor’s comments has been as divided as the debate about the individual mandate itself. Democrats have blasted LePage, but online commenters and email responses to a Portland Press Herald story have applauded him. Many of the emails refer to the hiring of 16,500 IRS agents to enforce the health care law as evidence that the federal government is imposing a punitive law on the public. The 16,500 figure originated from a 2009 estimate by Republicans on the U.S. House Ways and Means Committee, which handles federal tax legislation. The Treasury Department in February released an updated IRS budget request for fiscal year 2012. The request showed that agency is seeking about 1,269 employees to implement the health law. The mandate penalty is scheduled to be implemented by 2016. Estimates from the Kaiser Family Foundation put the penalty at $695 for each uninsured adult, or 2.5 percent of family income. Exemptions will be granted based on financial hardship, religious beliefs and those without coverage for less than three months. The Congressional Budget Office estimated that 4 million people will end up paying the penalty. However, there are questions about how effective the IRS will be at collecting penalty amounts, given the law’s strict enforcement limitations. The CBO analysis notes that legal penalties cannot be assessed and the health law does not allow the IRS to seize bank accounts or garnish wages. The individual mandate was originally a Republican concept derived from the conservative Heritage Foundation, which introduced the measure in 1989 as a counterpoint to Democratic calls for a single-payer health care system. In 1993, former U.S. Sen. John Chafee, R-R.I., proposed an individual mandate bill signed by 19 Republican co-sponsors as an alternative to President Bill Clinton’s health care overhaul. The proposal failed, as did Clinton’s health care effort.